Very grand. 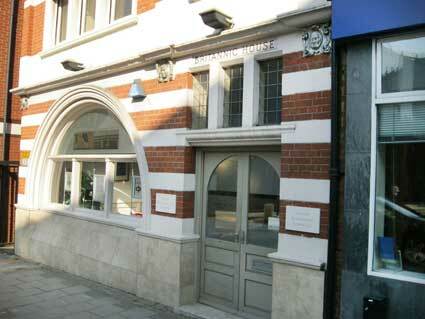 The small image above shows that this lettering was covered for some years by a Chelsea Building Society sign. The veining of the blue-grey mineral panel is a perfect setting for the gold-painted chisel capitals, despite the damage caused by the fixing of a covering sign (a range of drill-holes and plastic rawlplugs). Queen Victoria died on Tuesday, 22 January 1901 at the age of 81 to be succeeded by her son and heir Edward VII. With a reign of 63 years, seven months and two days, Victoria was, until recently, the longest-reigning British monarch and the longest-reigning queen regnant in world history. (That is, until Thursday 22 October 2015 when Victoria's great-great granddaughter, Queen Elizabeth II, became the longest-lived and longest-reigning monarch of the United Kingdom.) The new century and a short-lived period which has come to be known as 'Edwardian' beckoned and the volcanic events of the 20th century followed. 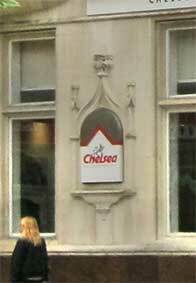 Chelsea House (Parr's Bank) was built at this important crossroads in history. 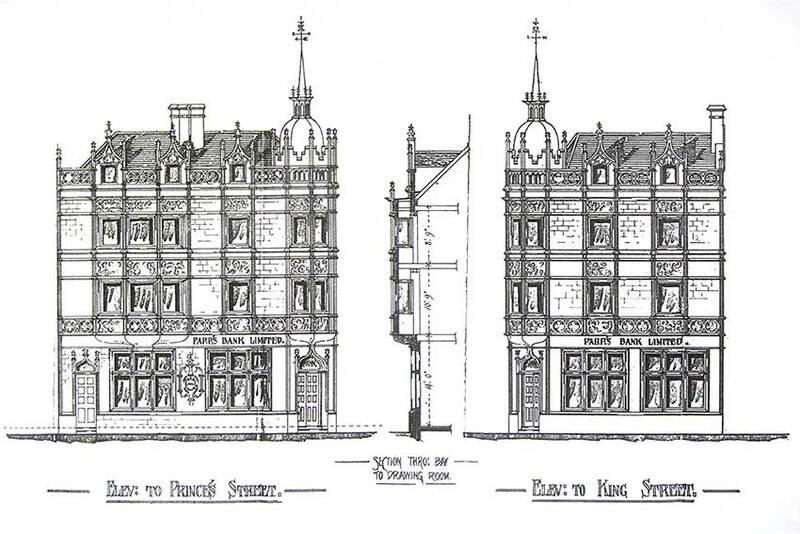 Architect's drawings of Parr's Bank, showing the Princes and Kings Street elevations with the lettered cartouche – which is still to be seen – with some further lettering above ground floor window level: 'PARR'S BANK LIMITED.'. 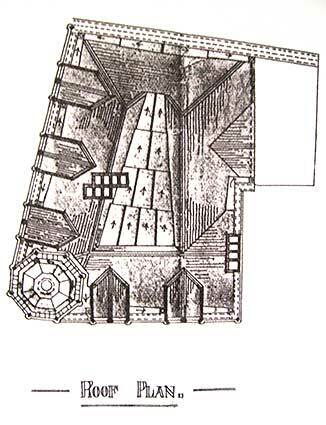 The aerial drawing is unusual showing rainwater flows, accesses, dormers and the spirelet at lower left. Above: ironmongery business, Alfred Stearn & Son (named on the upper panel (with '1900' above), later relettered: 'Commercial Union Buildings'). 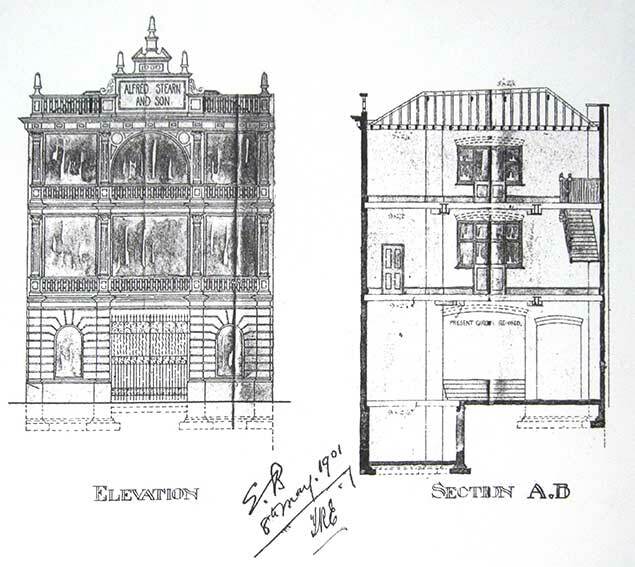 Architect's drawing showing considerable difference to today's aspect (below). 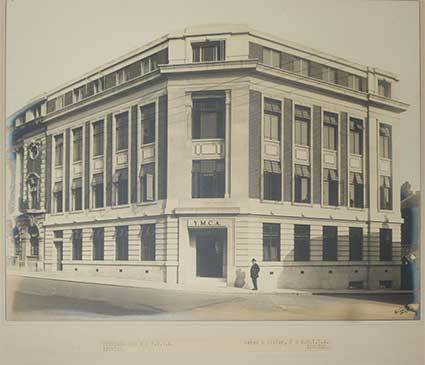 Parr's Bank Ltd (1788-1918). 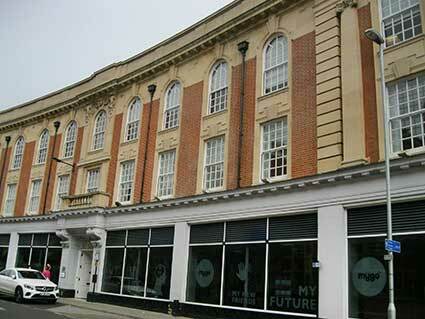 This private bank was established in Winwick Street, Warrington, in 1788 as Parr & Co by Joseph Parr, sugar boiler, Thomas Lyon, brewer and sugar boiler, and Walter Kerfoot, attorney; it was also known as Warrington Bank. 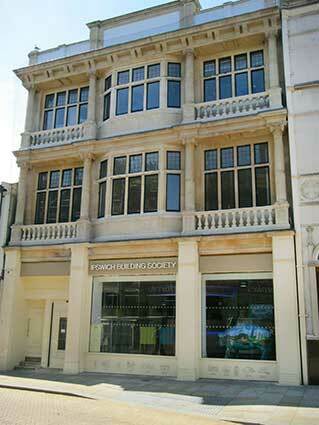 The bank was styled Parr, Lyon & Greenall from 1825 to 1851 and Parr, Lyon & Co from 1855 to 1865. 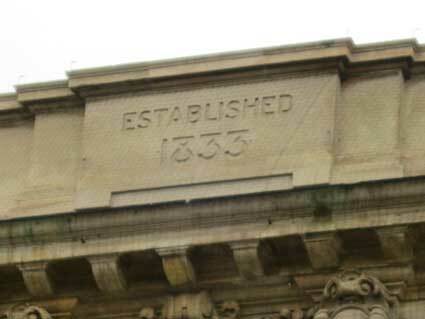 Branches were opened in St Helens (1839) and Runcorn (1853). 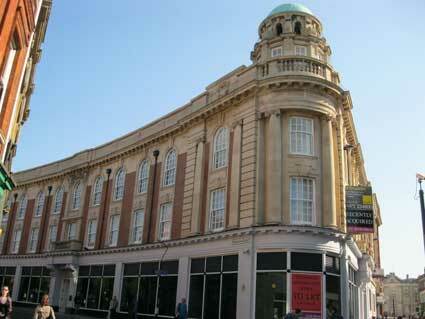 In 1865 the bank was reconstructed as a joint stock bank with limited liability, Parr’s Banking Co Ltd. The partners in the old business were paid �0,000 and the paid-up capital of the new bank was �0,000. Joseph Parr's son Thomas Parr was appointed chairman and the bank recruited John Dun, from Bank of Scotland, as its first general manager. 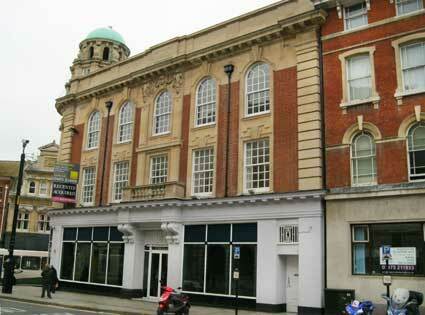 In 1877 a purpose-built banking house was opened in Winwick Street. 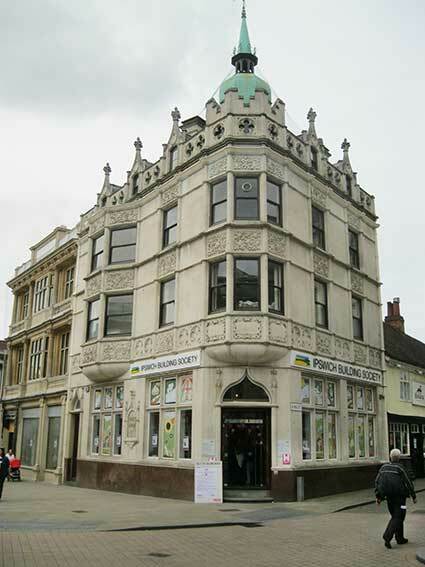 The bank expanded by acquisition of many other banks from 1865 to 1915 including in 1909 Stuckey’s Banking Co Ltd of Taunton (or the Somersetshire Bank), which “wielded great power in the west of England” and had the largest note circulation of any bank in England outside the Bank of England". 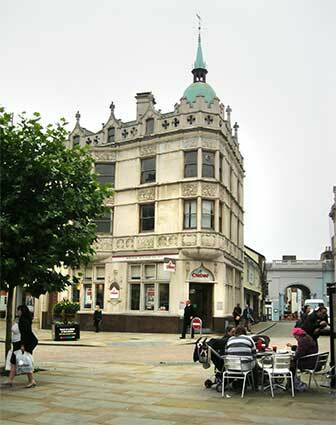 In 1892 the bank became known as Parr’s Banking Co & Alliance Bank Ltd. By 1890 it had 43 branches and sub-branches, rising to 136 in 1900 and to 329 by 1918. 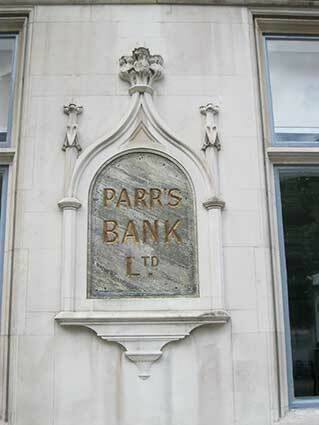 In 1896 the company’s name was shortened to Parr’s Bank Ltd. 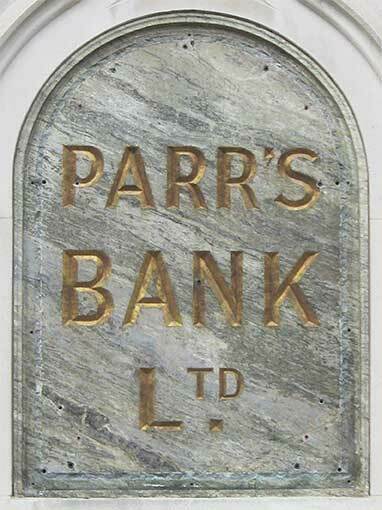 In 1918 Parr’s Bank Ltd amalgamated with London County & Westminster Bank Ltd of London, to form London County Westminster & Parr’s Bank Ltd. At that date 235 branches and 94 sub-branches were operating. 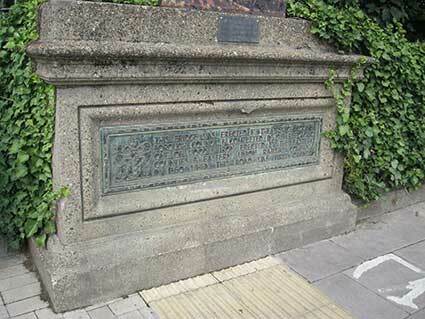 After Alfred Stearn & Son had vacated the next-door building it was taken over by Commercial Union Assurance and they went to the trouble of having the words 'COMMERCIAL UNION BUILDINGS' in relief on the upper stone tablet. During renovation, a covering layer of cement render was removed here and the traces of the letters were discovered where some previous builder had hacked them off around the mid to late-1950s, presumably when the bank expanded into this building. 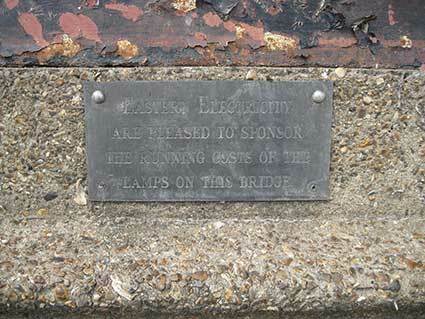 The shine on the encapsulated photograph below obcures it a bit, but the lettering is largely visible. 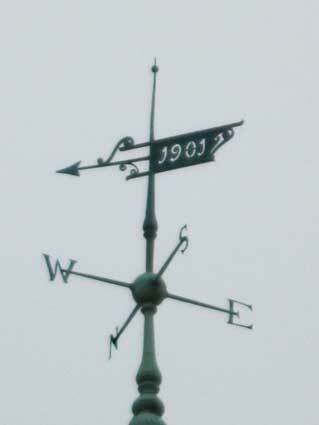 For other dated weather vanes see Tolly Cobbold Brewery and St Lawrence Church. 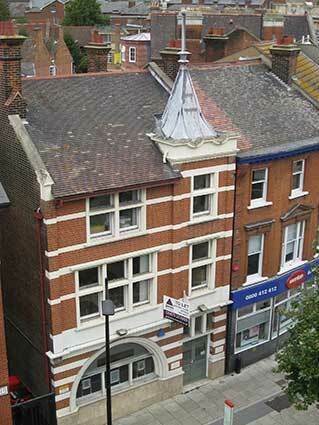 See also our Brook Street and Dogs Head Street pages for images of a previous IBS Ipswich branch. 2007: The University of Suffolk Waterfront Building (and '?' sculpture). A nice addition to the public art of Ipswich. 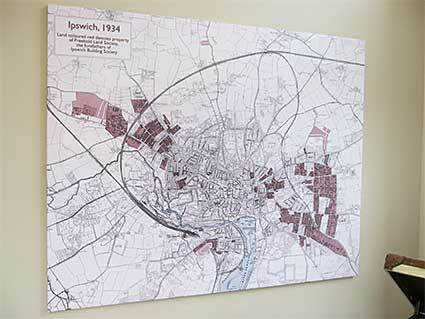 After the official opening of the town centre branch on 23 January 2018, when BBC Radio Suffolk broadcast from the event, Borin Van Loon's map of the Ipswich & Suffolk Freehold Land Society developments in Ipswich up to 1934 was on display in the entrance hall of Mutual House, attracting much comment. See our FLS page for a larger version. 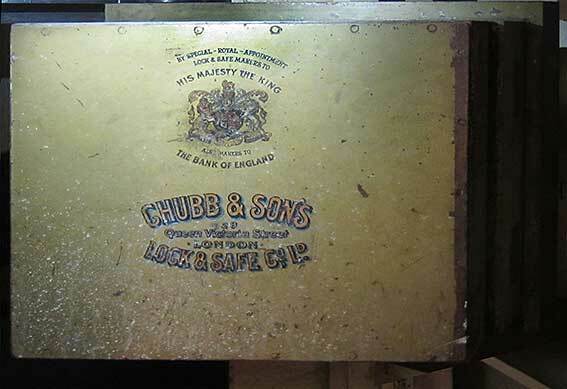 The homophone 'Chubb' uses the the fish, the Chub, as its emblem. Only, perhaps, the misalignment of the '128' in the address suggests that it is hand-painted (and not a transfer). 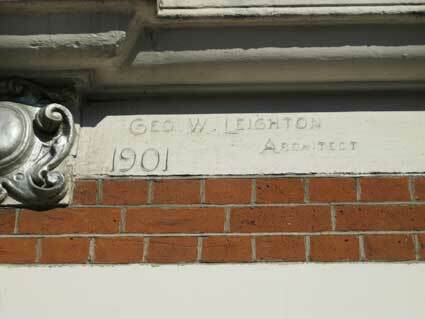 Was this the office of Mr Leighton, or did he sign his building as a painter signs his canvass? 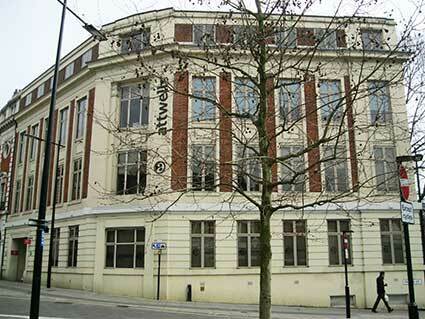 Another building signed by the architect is at number 36 Museum Street ('R.C. Wrinch'). 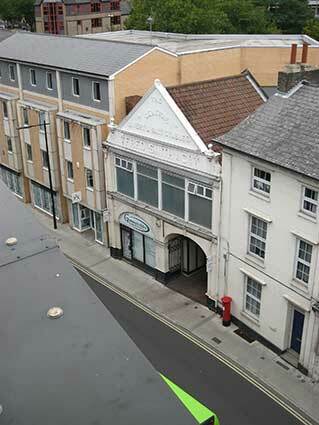 The untidy alleyway beside the building rather detracts... 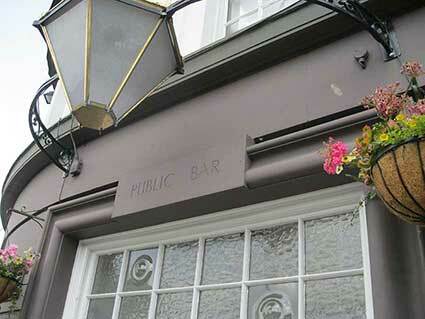 Unfortunately, since the above shot was taken in June 2004, the frontage has been repainted and the signature made barely visible (lower shot July 2004). 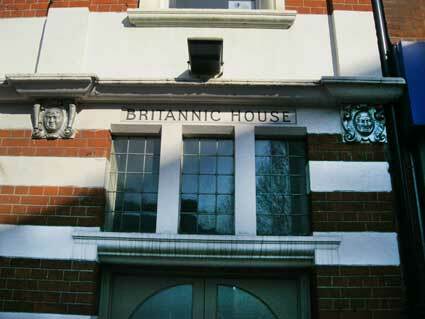 Meanwhile, the golden crest is resplendant and further along the two individually-styled golden grotesque masks either side of 'BRITANNIC HOUSE' (enlarged in the inset below). Only a few doors down from Britannic House towards the junction with Civic Drive is another example of 'lettering over the door'. Beneath the deco-ish frontage overhang, it echoes times past: 'THE EMPLOYERS' LIABILITY ASSURANCE CORPORATION LTD.' This is number 34 Princes Street. stands in relief against a curving cornice, above soaring ionic columns. Below, the solemn faced sun motif sitting on scroll flourishes is a nice touch repeated in the wrought iron balcony trims. Designed by E.T. 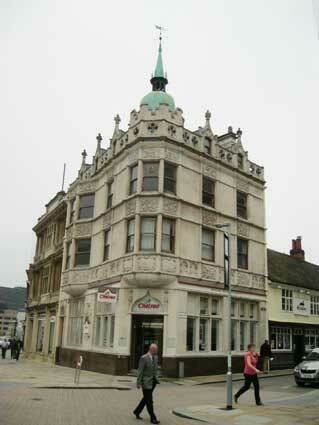 Johns and built in 1913 for the Sun Fire Insurance Company this building, photographed in June 2013 before a national bicycle race (hence the barriers and lack of people), was empty with a 'Sale agreed' sign on it. The Sun Alliance Building (adjoining Century House at right) has a heavily rusticated stone first floor to suggest strength. The central section of the first and second storey is framed by Ionic columns with large windows set in the brick facade. 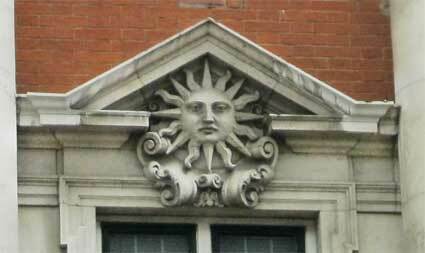 The cartouche with the sun, the company's emblem, is set above the central window on the first floor. E.T. Johns' work can also be seen opposite. 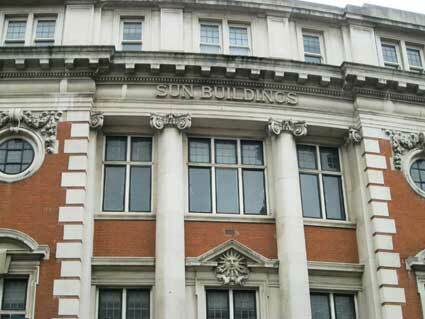 See our Ancient House page for a 'Sun' fire plate, placed there by the Sun Fire Office, an early incarnation of the Sun Alliance company (that page gives a potted history of the insurance company). [UPDATE 14.3.2016: "You might be interested to see the two attached images. 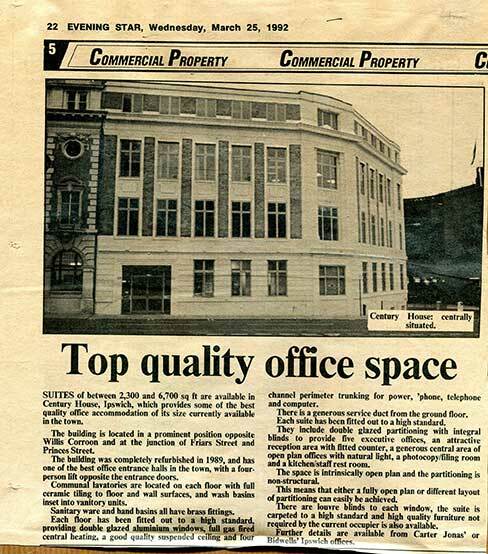 The cutting from the Evening Star, dating from 1992, is pretty self-explanatory. It's an advertorial for the building, and I clipped it then because I already had the other picture. 'PREMISES FOR THE Y.M.C.A. Johns & Slater, F. & A.R.I.B.A. 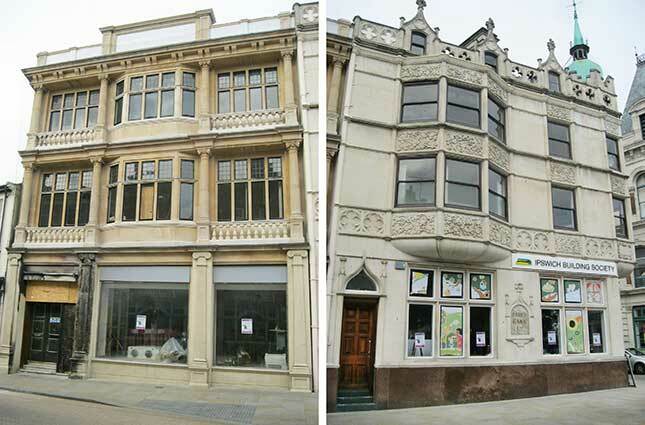 The photograph above right shows the building in 2017. The angled, corner entrance has been blocked and the door to the left enlarged. Sun Buildings just visible at far left. For another building used by a Young Christian Association at one time, see the Garratt Memorial Hall (Gainsborough House) in Bolton Lane. with stylish numerals such as the '8' with its flattened top. 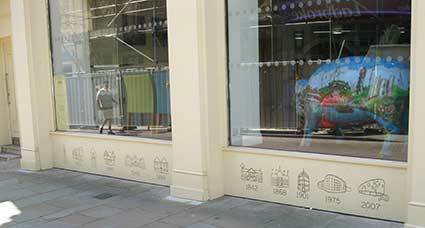 This feature is repeated round the corner in Princes Street (see below). R.D. and J.B. Fraser's furniture emporium burned to the ground in a famous and well-photographed fire on the sixth of April, 1912. The horesdrawn fire engines of the time were outdone by the fire which, seeming to have been extinguished, flared up again later that night. Apparently rolls of linoleum burned and exploded, spreading the fire to other shops in the area. The building we see today is a replacement by E.T. Johns from 1913-14(?) 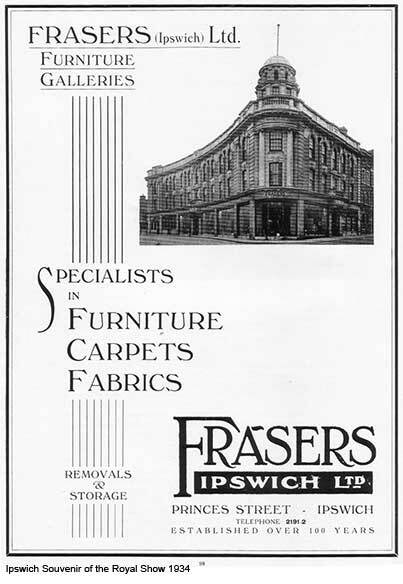 of the original, short-lived, Frasers building by Eade & Johns in 1890. Incidentally, horses weren't abandoned by the local fire service until 1920. We recall this as Maples furniture store in the late 1970s with mountainous sofas and armchairs and more-than-life-size china greyhounds. Below: the facade on Princes Street. 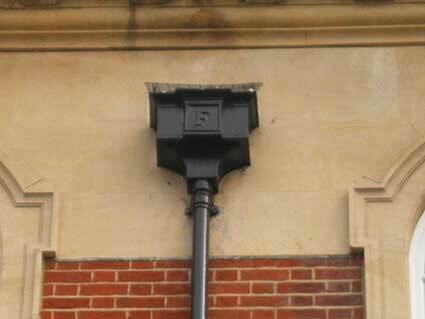 It was only in 2017 that it was pointed out to us that the rain hoppers here bear the initial 'F', so we can add them to our Rain hoppers page. 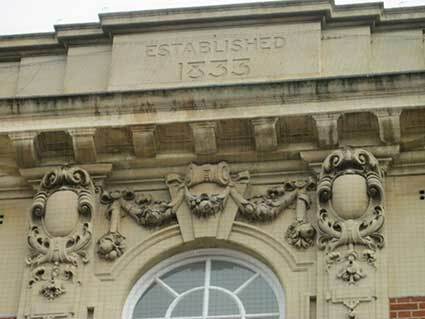 Below also, the decorative swags and flourishes high above the central doorway on Museum Street, separated from the company's date of establishment by a modillion cornice. The advertisement below shows the company promotion in 1934. 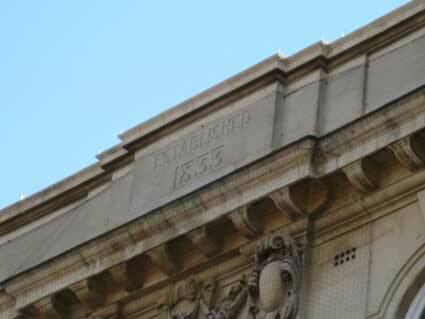 Boasting: 'Established over 100 years', this confirms the 1833 date on the cornice. On Heritage Open Day 2015 the views from the Willis building roof garden show (1). 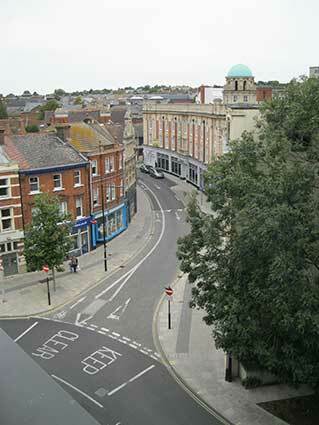 the junctions with Friars Street, Princes Street and Museum Street with the old Frasers building at right. (2). The George W. Leighton building at No.28. (3). Fred Smith & Co. building and (4) the remodelled junction of Princes Street with Civic Drive (right) and Franciscan Way (left); the junction with Friars Bridge Road is on the right in the distance. 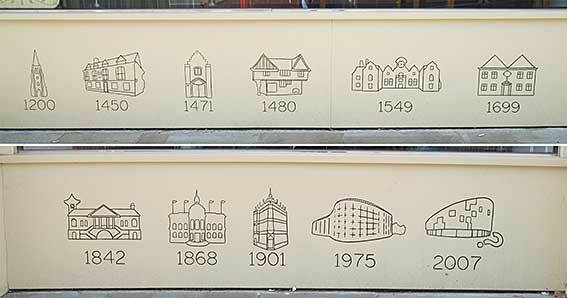 See also our Coytes Gardens page for a note about the way in which Princes Street was cut brutally through existing gardens and buildings to link Cornhill and Friars Bridge and then, in 1860, Railway Station Road (now all called 'Princes Street'). 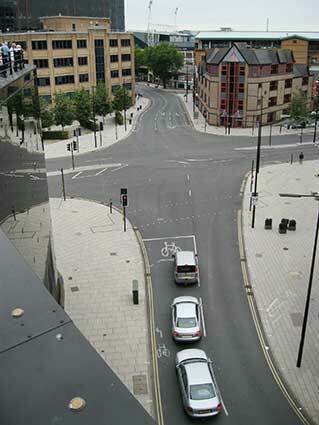 Railway Station Road included the Princes Street bridge: see below. 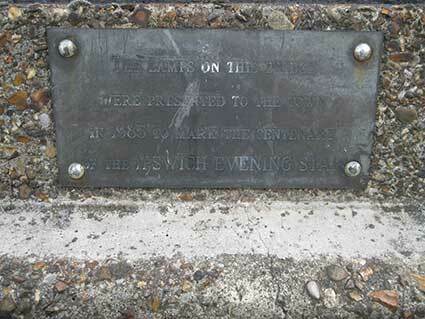 Another trace of the pre-1974 Local Governemnt Reorganisation 'Ipswich County Borough Council' can be seen on street nameplates on Civic Drive. Above left: the view from the reshaped station forecourt in 2018; Princes Street Bridge over the river is visible at left. 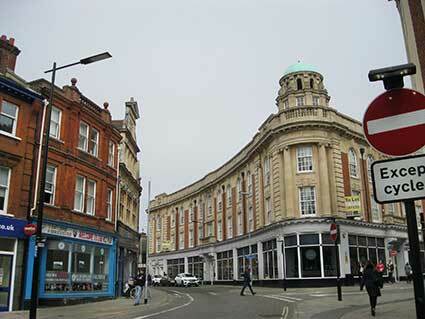 Above right: the building in 1982, photograph courtesy The Ipswich Society (see Links). 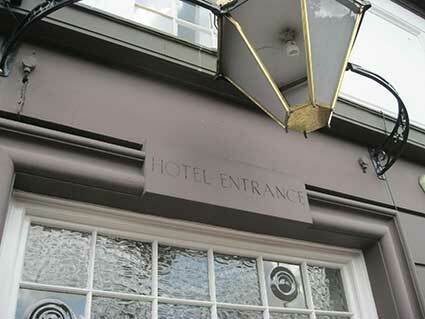 Noticed during our research into public clocks, the words 'HOTEL ENTRANCE' (west) and 'PUBLIC BAR' (east) are incised ito the lintels above the entrances on Burrell Road. Another, unlettered, entrance to the bar opens onto Princes Street, but that look as as if it might have originally been a fire entrance. 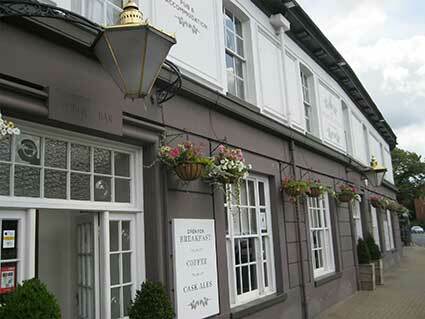 This building opened as a bar/hotel directly opposite the railway station before 1860. 'MATTW. T. SHAW & CO.
Matthew T. Shaw and Co. of West Ferry Road, Millwall, London E.C. 1859 of 64 Cannon Street, London EC. 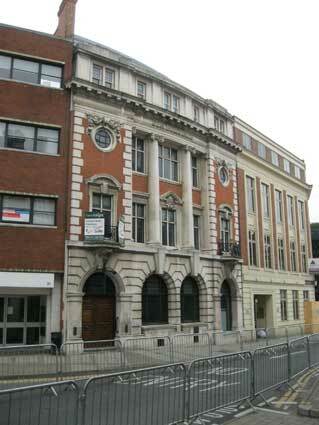 1868 of 142 Cannon Street, London Bridge, London EC. 1914 Constructional Engineers, Bridge Builders. Specialities: high-class constructional steel and ironwork, bridges, roofing, girders, sheds, tanks, forgings. Employees 25. 1961 Structural engineers and structural steel work fabricators. 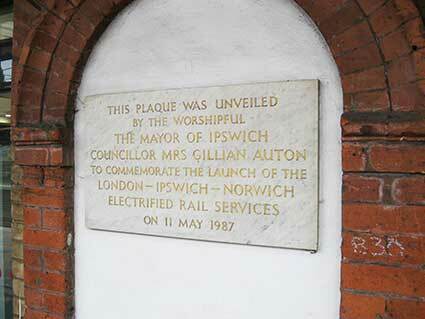 Ipswich railway station was re-sited from the original EUR station site in Croft Street to its present location in 1860 and the main building was thought to be principally the work of Peter Bruff (the engineer of Stoke railway tunnel); who had certainly started the structure. The actual design was in the Italianate style and submitted by architect Sancton Wood (1816-1886) as part of a competition. When the new station was completed, a new road (Railway Station Road, later and extension of Princes Street) linking the station to the town was also opened. By the 1860s the railways in East Anglia were in financial trouble and most were leased to the Eastern Counties Railway (ECR). Although they wished to amalgamate formally, they could not obtain government agreement for this until 1862, when the Great Eastern Railway (GER) was formed by the amalgamation. The island platform at Ipswich was added by the GER in 1883. Although access to such a platform could be achieved by boardwalks across the lines at the end of the platform slopes, it is most probable that the footbridge was built in 1883. 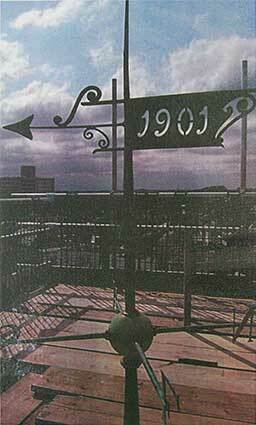 See our page on Public clocks in Ipswich for a 2018 view of the station car park and its clock. 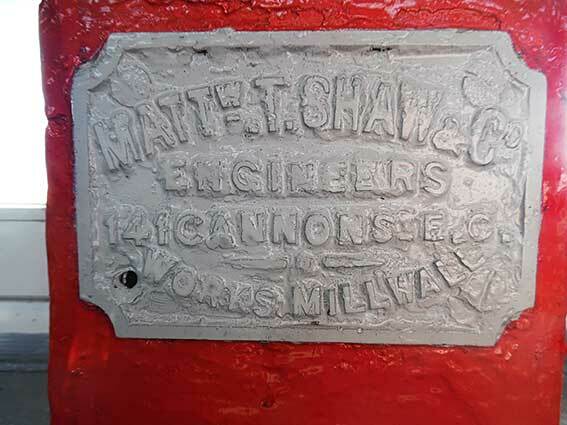 See also our Lettered castings index page.